Editor’s Note – Farmers’ Markets are on the rise in the U.S.! Find out why that’s a good thing and which states have the most available local food. This article + infographic was originally posted on FIX.com and written by Robin Horton. Both casual cooks and celebrity chefs flock to their local farmers’ markets to avail themselves of the freshest locally grown produce straight from the farm. In addition to produce, farmers’ market visitors will also find regional and artisanal items such as baked goods, dairy products, grass-fed meats and free-range eggs, locally cultivated flowers, prepared foods, and even local crafts. Although they may vary in size and in the diversity of products sold, all famers’ markets feature growers and producers who sell their local produce and other products directly to the public. Farmers’ markets provide and sell more than a gorgeous head of lettuce or an exotic vegetable you can’t find in your big box supermarket. Whereas farmers’ markets offer a wide variety of local and regionally sourced products, they may also provide the only access to healthy, affordable food for many living in densely populated, low-income urban neighborhoods where such nutritious items are scarce. Typically in these neighborhoods, the only readily available and affordable food is from fast-food chains and convenience stores, which generally do not offer healthy options. This lack of access to fresh food is a chief factor in the rise in obesity and diet- related diseases in the economically disadvantaged population. As growing numbers of farmers’ markets now accept vouchers from federal food assistance programs such as SNAP and WIC, shopping at farmers’ markets has become accessible to low- income families. Access to fresh local food from small-scale producers is increasing rapidly. 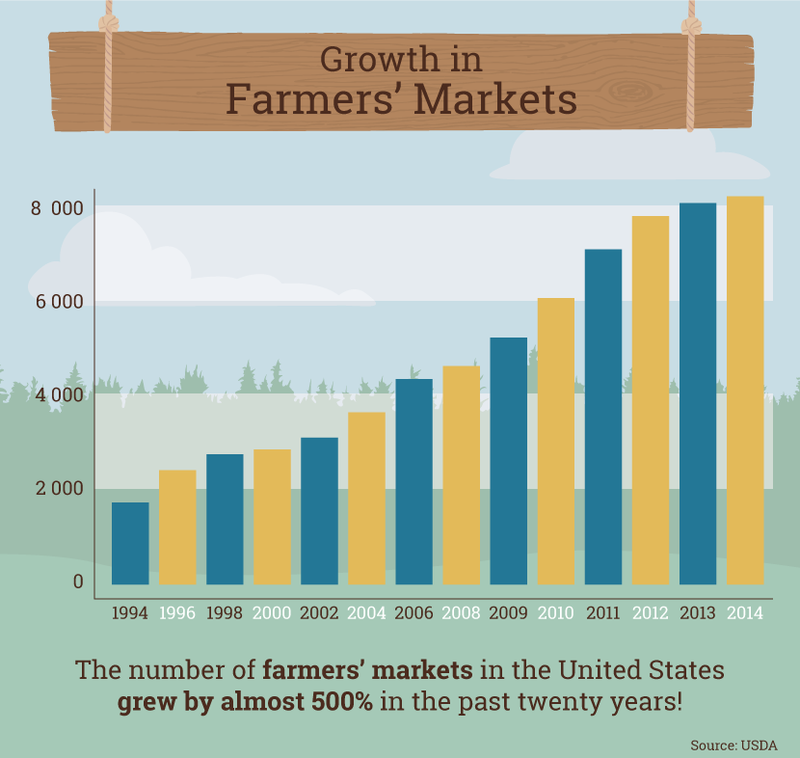 According to the USDA Farmers Market Directory, from 1994–2014, the number of farmers’ markets in the United States rose from 1,765 to more than 8,268 and increased by 180% from 2006–2014. Buying directly from local farmers and purveyors represents significant health benefits. As seasonal produce and locally produced items are likely to be consumed soon after harvest, they offer higher nutritional value than does non-local produce, both organic and traditionally grown. Local may not mean organic, so be sure not to confuse the two. However, some studies have suggested that organic foods might be higher in nutrients than are non-organic ones. In both cases, farmers’ markets support food security because consumers shopping there know the origins of the specific foods consumers buy. The benefits of farmers markets extend well beyond the food on one’s plate. 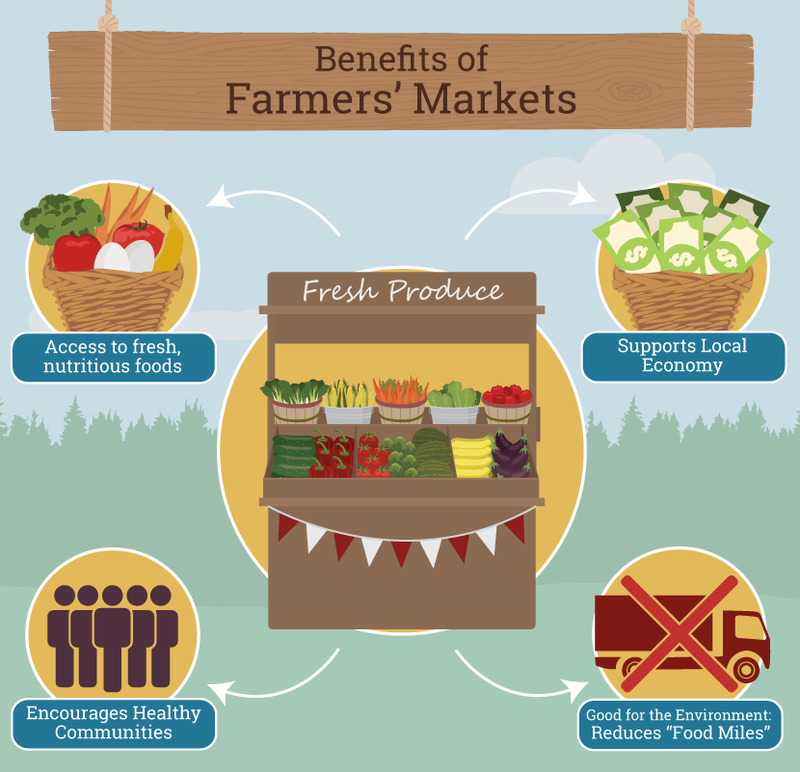 In addition to supporting the local economy and increasing opportunities for farmers and small businesses, farmers’ markets support the health and wellbeing of the entire community by fostering personal connections between it and local farmers and shoppers. This influence might prove to be long term, as local vendors often offer consumers health and nutrition education, which can encourage healthier lifestyles. Direct from the source and local food distribution systems are good for the environment because they reduce “food miles” – the distance it takes for food to travel from the source to the plate – so less fossil fuel used in transporting products, which translates to a lower carbon footprint. Farmers’ markets offer seasonally based foods, so the markets tend to operate more frequently during local growing seasons. But winter and indoor farmers’ markets are on the rise, making it possible to find a variety of fresh local products throughout the year. Unsurprisingly, what’s available varies region to region. This means that you’ll find artichokes in California, peanuts in Georgia, taro and breadfruit in Hawaii, and pawpaw in the nation’s capital, (aka “poor man’s banana”), North America’s largest edible native fruit, which grows on the banks of the Potomac River. Finding a local farmers market in your area is easy. The USDA provides a searchable farmers market directory with an interactive map enabling users to search through more than 8,260 markets by zip code, payment accepted, and products available. The database also offers a listing of winter markets. 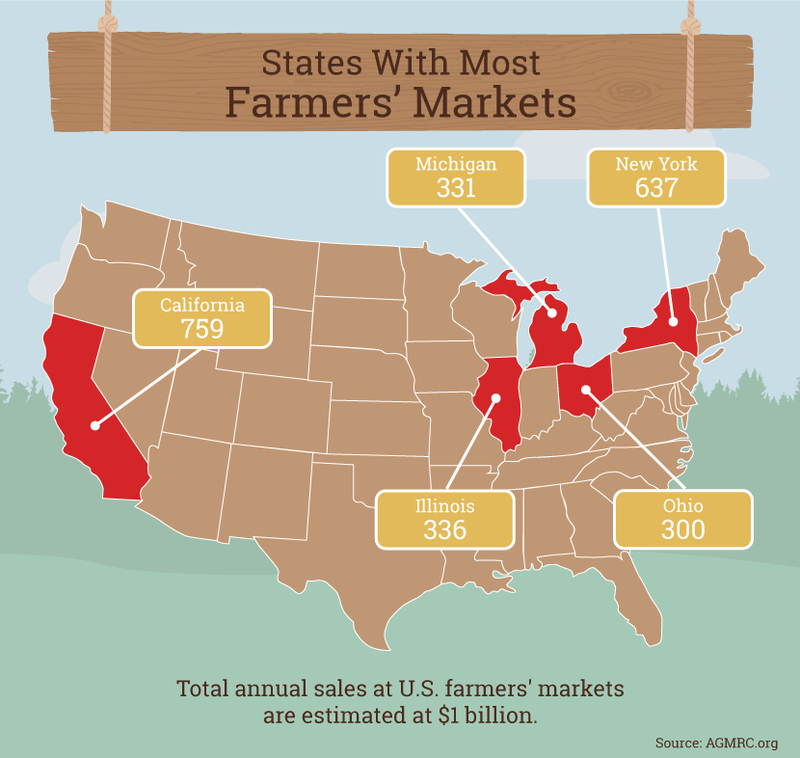 The states with the most farmers markets are California (759), New York (637), Illinois (336), Michigan (331), and Ohio (300).1 If you find yourself in Washington, D.C., the USDA even has its own farmers’ market that it operates as a “living laboratory” for farmers’ market operations across the country. Local Harvest also publishes a great farmers’ market directory, and if you have your location enabled on your computer or device, it will automatically list markets near you as mine did for me. “Meet me at market” is what residents in Lancaster, Pennsylvania, say about the Lancaster Central Market, the country’s oldest farmers’ market, which has occupied the same location in the heart of Amish country for over 275 years. There you can savor regional specialties such as Pennsylvania Dutch sausage, chowchow (pickled vegetables in a spicy mustard sauce), and if you are adventurous, headcheese. While not the eldest, Seattle’s Pike Place Market on 9-acres might be one of the country’s largest, having opened in 1907 with 70 wagons. Talk with the growers and purveyors at your local farmers’ market about what to consider when selecting certain fruits or vegetables or to learn when your favorite items will be in season. Ask the farmers and their representatives to share how the food is grown and to provide some great ideas on how to prepare it. At Chicago’s Green City Market, some the city’s well-known chefs offer cooking demonstrations, and local experts teach gardening classes. Many farmers’ market visitors become loyal customers, and if you become a regular at your local market, you might just find yourself enjoying a few perks only available to customers who know their growers by name. About the Author – As the founder of the popular Urban Gardens blog, Robin Horton is a wealth of knowledge. She is also a seasoned designer, writer, and speaker. Robin’s blog features a creative mix of urban style, design, and nature, and was nominated by Better Homes and Gardens magazine as one of its top 10 garden blogs for 2015.